There are a great many blogging and sharing services available. Each one is very different and has different uses and types of users. When you have so much choice, selecting the right blog service for your needs can be tricky, if you aren’t familiar with the main services out there. Read this guide to get a better idea about which platform is the right one for you. Do you need your own website that can be customized? Do you need to post plenty of text based content? Do you need many advanced customization options? Then WordPress is your ideal solution. WordPress is a hugely popular blogging platform. It is very powerful and flexible and you are not limited to only creating a blog. You can create almost any kind of site imaginable. Do you want a site that can be customized to your needs? Will you be writing lots of text? 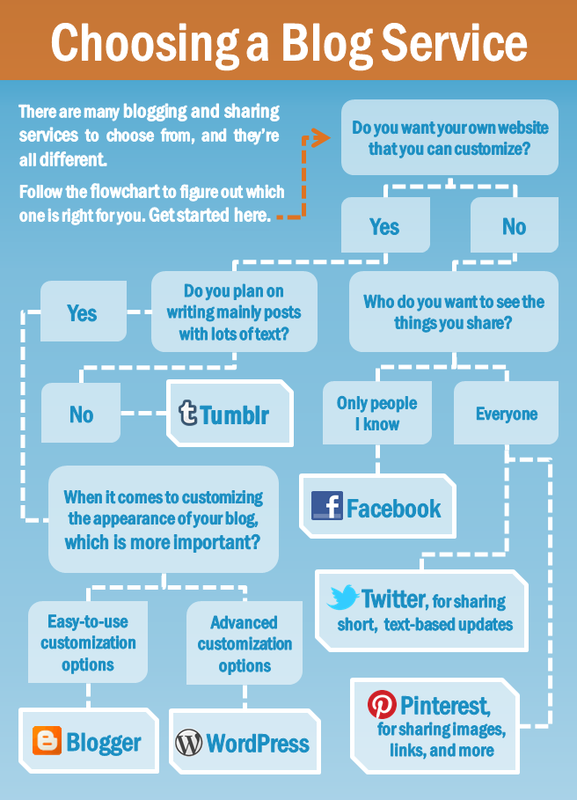 Do you prefer having easy to use options for customizing the appearance of your blog? Then Blogger is your platform of choice. Blogger is in fact owned by Google. While it may not have all the bells and whistles that come with WordPress, it is by default faster and more search engine optimized. Need your own website with full control? Do you plan on using less text and more photos and images in your posts? Tumblr could be just what you are looking for. Unlike the other two big blog platform, Tumblr puts a greater focus on different types of media, particularly images. Do you want to avoid the hassle of getting hosting for your blog? Do you only want to share with people you know? Then use Facebook to post your thoughts and updates. As the world’s largest and most popular social network, Facebook has all the features most people want to be able to connect to people and share information and messages. Do you need a way of sending short, text based updates? Do you want to share your updates with everyone? As a micro-blogging platform, Twitter will be suitable candidate. Twitter is great way of telling people what you are doing or thinking in real time. But also it has become one of the fasted news gathering sources, where people who are at the scene can break the news to the world. Are you looking for a more visual blogging platform? Do you prefer not using a costly self-hosted solution? Want to share your posts with everyone? Pinterest may what you were looking for. With an emphasis on high quality images, Pinterest is an engaging and interesting way of both sharing images and telling a story through the way you showcase your boards.